We haven't had TB since TB testing came in 70 years ago. Indeed, we haven't bought in any dairy animals for almost fifty years! However, that all changed when we had our first ever animal to react to the test and we lost our Official TB Free status that is required by law to sell raw milk. Our raw milk sales had to stop. We thought we would be back selling raw milk in October, by passing two consecutive TB tests to regain our official TB free status. Our business has struggled, taking quite a substantial loss every week believing all would return back to normal after six months. We passed our first test in August, but had three 'reactors' in the second test two months later. This means we will not now have raw milk until at least March 2019. Our business cannot cope with this ongoing loss of income from not being able to sell raw milk. 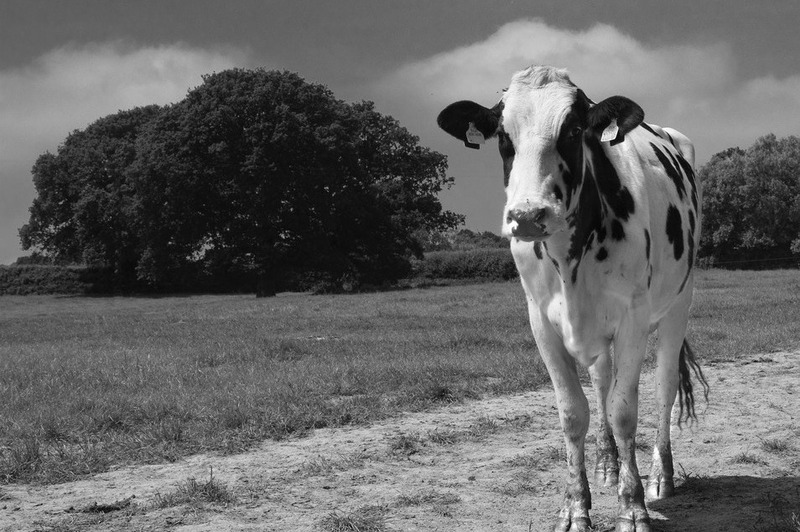 Raw milk has been our passion that we have committed so much to over the last ten years. During this time, we have sold our organic grass fed raw milk to thousands and thousands of wonderful customers both locally and nationally, with doorstep deliveries, pioneering nationwide couriered deliveries, and attending farmers markets, principally in London, including Borough Market. Selling raw milk has been amazing. It has given dad and I the chance to stay farming, and even buy the farm. The journey has had tough moments such as being taken to court by the FSA for selling raw milk in Selfridges (after two appearances at Westminster Magistrates Court, the case against Steve was dropped), as well as highlights; being in the final three in Farmers Weekly Dairy Farmer of the Year 2012, and featuring in The Moo Man, an award winning film about our farm that featured at the 2013 Sundance Film Festival. Hook and Son became the leading raw milk seller in the UK. We have done our absolute best to promote raw milk, its benefits and the right for consumers to be able to choose to buy it. It really hurts not being able to sell RAW MILK when we are all so passionate about it! Especially as all our cows that have been taken for TB have been absolutely clear on post mortem and on culturing of their lung tissue. Indeed, we have tested our milk for TB and there is absolutely no TB in it. The law is damaging our business. Over 75 % of TB reactor cattle in the UK go into the food chain, and you could eat a rare fillet steak from a TB reactor, but you cannot have raw milk from our cows even though we can prove there is no TB in our milk! Why are there such double standards in 'protecting the public health?' Either there is a risk or there isn't, and certainly more accurate modern science that is available should be used in this day and age to determine if TB is present or not. Businesses like ours can be sunk because of an antiquated TB test that isn't great, and there is huge inconsistency from government in what is the actual public health risk from TB in meat and in milk. Anyway, I've had a bit of a rant, but as you can tell, we need your help, so that we will still be here in the future to supply you with our grass fed organic raw milk again. Without help and investment, our business is not sustainable. We do want to be here in the long run to sell our wonderful raw milk again! So, we are crowdfunding! However, we do not want to crowdfund simply to help our cashflow, until raw milk comes back; we also need to raise working capital to start new enterprises so that our business is financially viable when we cannot sell raw milk because of current UK TB law. We do not have the 'safety net' of a contract with a milk buyer which is normally the case in the dairy industry. We have to sell all our milk ourselves, which was fine when we were selling raw milk, but isn't fine whilst we can't sell raw due to losing our official TB free status! The new enterprises we are looking to start, are our own organic free range egg laying enterprise, and a glamping enterprise on our organic farm. 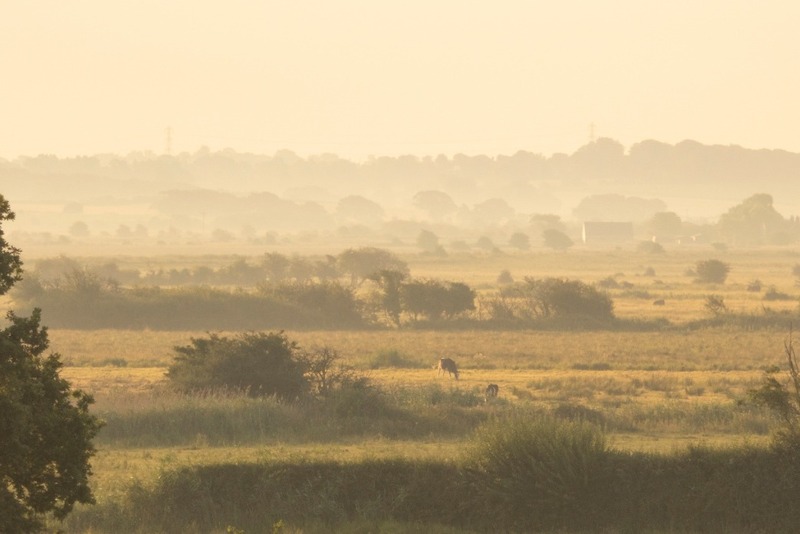 The good news is that we have been given permission by Natural England to have some mobile glamping units on our land on the beautiful Pevensey Levels. This is brilliant! We are looking to make our own log cabin style glamping units that will be two four and six bed. They will be located on our land on the Pevensey Levels, and will be stunning! Renting these out for holidays will create an important new income stream that we desperately need, but at the same time enable people to see our farm, meet the cows, and experience a real break on the beautiful Pevensey Levels, that is fantastic for waterfowl, birds, all sorts of flora and fauna...….including our lovely cows of course! Our crowdfunding campaign will have some great rewards.... do have a look! 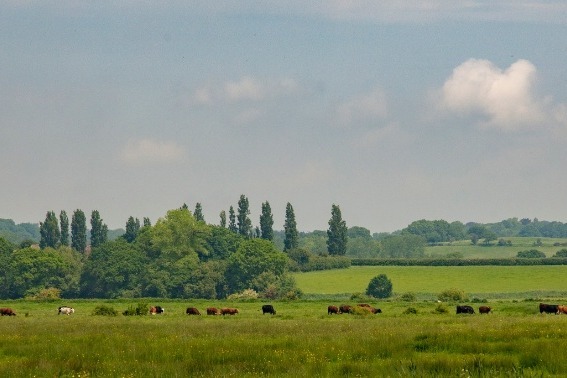 Hopefully, one day, you will be staying in one of our lovely log cabins on the marsh, watching lapwings, as the cows walk past your window ...….it's time for milking! PLEASE NOTE, REWARDS WILL NOT BE ACTIVATED UNTIL HALF THE TARGET IS RAISED. ONCE WE HAVE HIT £75,000, THE REWARDS WILL BECOME LIVE. £75,000 IS WHAT WE NEED TO RAISE AS A MINIMUM IN ORDER TO ENSURE WE BUILD THE GLAMPING CABINS. £1000 - A one week free rental hire of one of our 6 bed glamping holidays on the Pevensey Levels subject to availability. This does not necessarily need to be a single £1000 donation, it can be cumulative, so four donations of £250 would entitle you to one week free glamping holiday. £5000 - A maximum of 7 weeks of glamping holidays at our farm to be used in five years (by 31st December 2024) subject to availability. Any of these seven weeks glamping holidays can be transferred to family and friends. Again, donations can be cumulative to amount to a total of £5000 to be entitled to the £5000 level of reward. £10,000 - Entitles the donor to a one week free glamping holiday per year for the remainder of the donor's life, subject to availability. These glamping holidays can be transferred to family and friends for the remainder of the donors life after which this entitlement expires. The donation can be cumulative, so for example, two £5000 donations will entitle you to the £10,000 level of reward. We will keep you up to date when we have more news. 1. This cow is not being milked and won't be milked until she calves in two months time. 2. If we have inconclusive animals when we are TB free and selling raw milk, having inconclusives does not stop you from selling raw milk, so what is the difference in terms of protecting public health... there isn't any difference, so why not allow us to sell raw milk now. 3. Since October 2017, we have had 7 whole herd skin tests, and 2 whole herd Gamma blood tests. In all these tests, the government vets have killed 31 of our animals (including a couple of calves, incalf heifers and cows), and have not actually found any strain of TB. 4. If I ask government vets to provide evidence of an actual TB public health risk in our milk they cannot demonstrate there is any actual TB present. So we're having a battle with the APHA. My wife Claire suggested I write this update this morning in a calmer state than I was last night; it would have been a bit of a rant! It is a crippling situation not of our own making. We have no control over this TB situation at all. We are at the mercy of the APHA and current TB law and TB skin test which I don't believe is fit for purpose. We need to cashflow ourselves for the next two months. We are open to any ideas...please let us know if you know someone who could help us get over the line and survive until May when we hope, at last, to have raw milk back! Thank you for your support over the last 24 hours. We've just had out TB test, and we're still in limbo. We had no reactors, which is great, and we had one inconclusive animal. The government vets at the Animal and Plant Protection Agency (APHA) will be phoning me later today or early tomorrow as to whether or not we have got our TB free status back now, or if we have to wait a further 60 days for the one inconclusive animal to be retested, before we can get our TB free status back and be able to sell raw milk. The animal in question isn't being milked at the moment as she is in her dry period and is due to calve in May, starting her next lactation then, so she isn't an animal whose milk we would have to keep out anyway. When we had our TB free status, having inconclusives didn't cause us to lose our TB free status, or to stop selling raw milk, so we are hoping this will be the case in this instance, and our TB free status is reinstated. We're all on edge waiting to see what our fate is...I'll update you as soon as I hear from the APHA! Hello everyone that has supported us over the last few months to help us with our cashflow. It has been and still is a desperate struggle to survive. We have quite a backlog of bills, around £50,000, still to pay. We are up against our overdraft limit, and feel so frustrated that we haven't been able to sell our raw milk for almost a year now. It was April the 12th when we had to stop selling raw milk. Hopefully our fortunes will take a turn for the better tomorrow, when we hope to go clear on our second consecutive herd skin test. If we have no skin test reactors, we will be able to sell raw milk again. 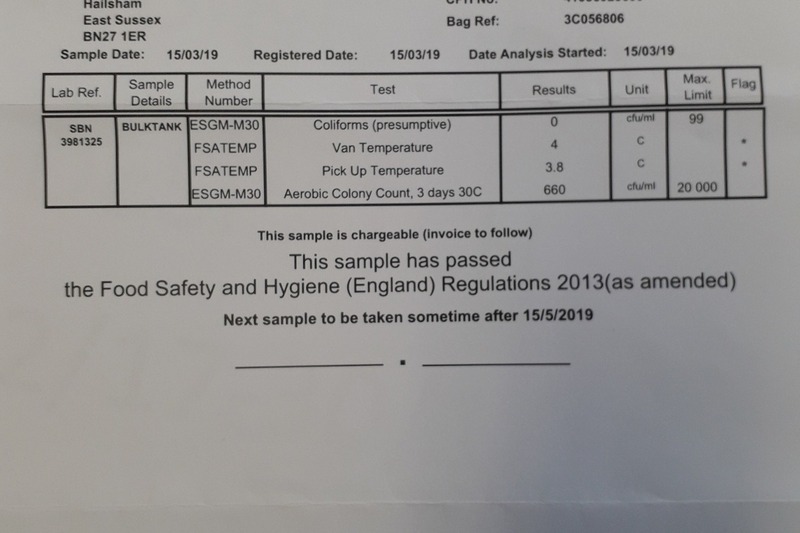 The Food Standards Agency have tested our milk last week, and as you can see, our milk sample taken from the milk bulk tank passed the legal hygiene requirements with flying colours! I will have another update one way or the other for you all tomorrow! Hello crowdfunders and all of you that are supporting us. I'm thrilled to tell you that we passed out TB test today! Hopefully I will have more news soon about what this means in terms of when we will have raw milk back.